At their July 27 meeting the Fairfax County Board of Supervisors voted unanimously to send a letter to VDOT asking for better trail maintenance. Supervisor Cook brought this matter before the Board along with a concern about the need for more frequent mowing of roadside grass. During the FABB monthly meeting in the Braddock District we discussed this issue with Supervisor Cook. He agreed that VDOT should do a better job of responding to concerns expressed by cyclists and other trail users about the poor condition of our extensive trail network. The timing was right because he was already planning to raise the issue of more frequent cutting of roadside grasses with VDOT. Thank you Supervisor Cook for listening to our concerns about the need for better maintenance of trails owned by VDOT. In addition, VDOT owns trails that run adjacent to major highways. Many of these trails have become dangerous to bicyclists due to uneven pavement, large deposits of salt and sand from winter plowing, and overgrowth of plants. VDOT needs to provide better trail maintenance to correct these issues. Therefore, Supervisor Cook moved that the Board authorize the Chairman to send a letter, a copy of which is attached to his written Board Matter, to VDOT on behalf of the Board requesting that it allocate adequate funding to mow roadside and median grass at least six times per year in the County and provide better trail maintenance. Chairman Bulova seconded the motion and it carried by a vote of nine, Supervisor L. Smyth being out of the room. 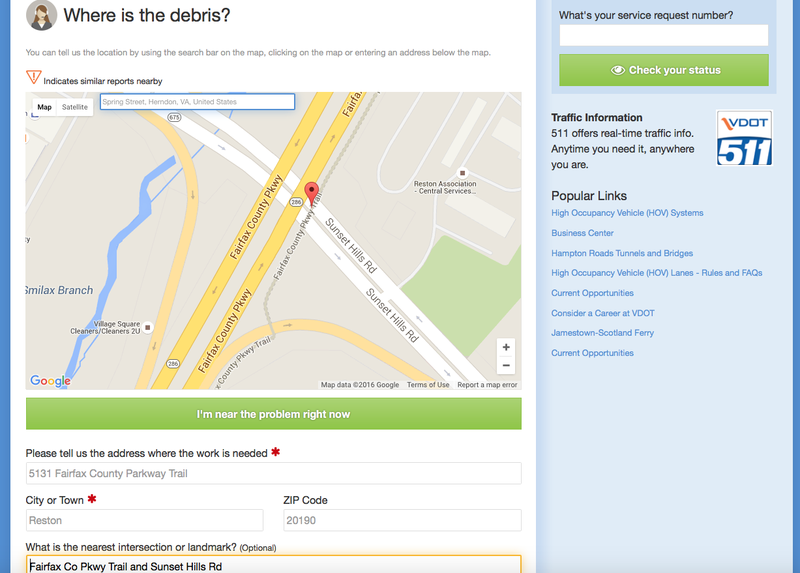 In related news, we recently contacted VDOT about this same issue. 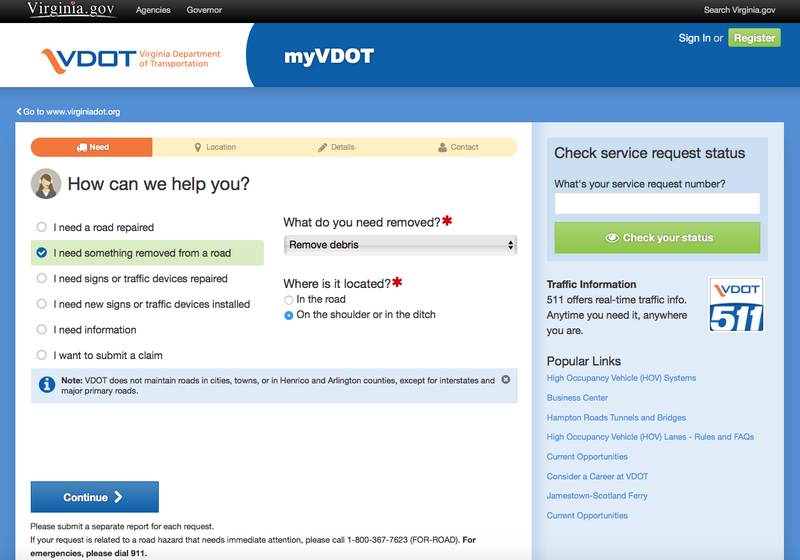 We noted that the myVDOT form used for reporting road problems does not include options for reporting problems with trails and sidewalks and we asked that they be included. 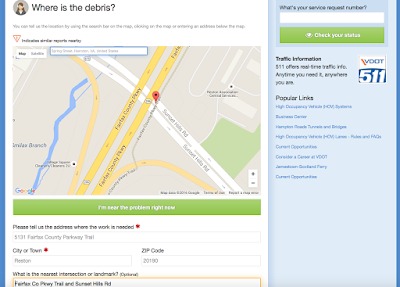 Earlier this year I had reported an accumulation of sand and gravel and other debris on bridges over the Dulles Toll Road on the Fairfax Co Parkway Trail and the Wiehle Ave Trail. That debris was put their by VDOT front loaders removing snow (and the other debris) from the roadway. I was forced to say the debris was in the road, on the shoulder or in the ditch when in fact it was on the trail. 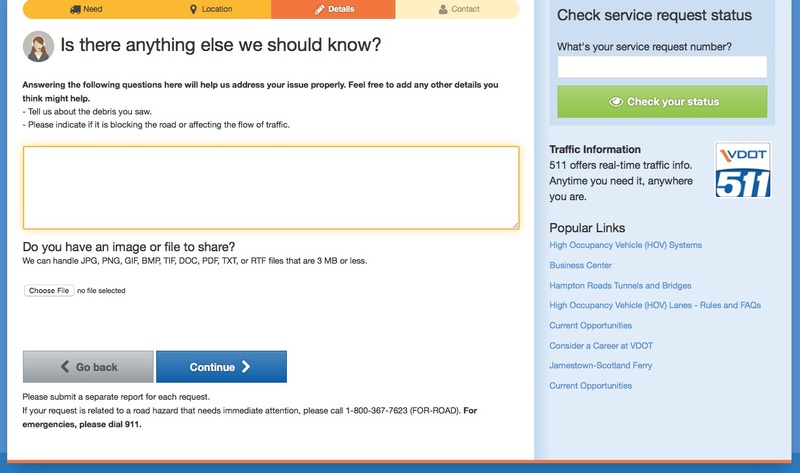 The next screen allows users to easily identify the location of the problem. In this case it was on the FFX Co Pkwy trail bridge over the Dulles Toll Rd. 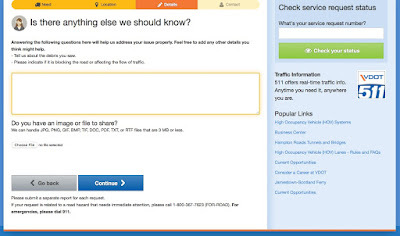 Once the location is identified, you can enter a description of the problem as well as uploading a photo. The first response from VDOT regarding the Wiehle trail was that they don't maintain the facility, to contact Fairfax County. Fairfax County confirmed that VDOT owns and is supposed to maintain that section of the trail. That was in early Spring. After contacting VDOT management directly last month we were told that the problems would be fixed, and within a week both bridges were clear of sand and debris. Thank you VDOT! 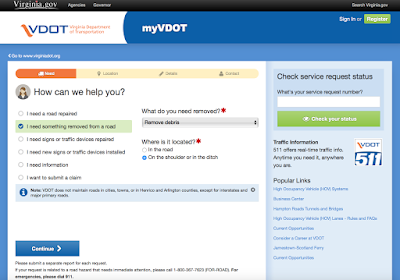 We were also told they would look into how the myVDOT form could be improved. It's been 12 years since the Commonwealth Transportation Board adopted its Policy for Integrating Bicycle and Pedestrian Accommodations [ http://www.virginiadot.org/programs/resources/bike_ped_policy.pdf ]. Clearly, much of that "integration" has not yet been achieved. They just mowed down an 80 foot wide swatch on Fairfax Parkway. None was encroaching on the trail nor a safety issue for cars. (8 feet wide would have been more than enough.) All the milkweed and pollinator plants were destroyed. The super generation of monarchs that was at its prime was massacred.